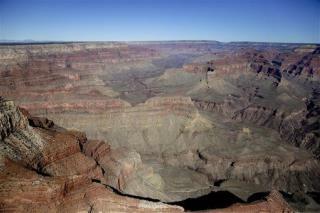 (Newser) – The Grand Canyon is nowhere near the grand old age of 70 million years that earlier studies claimed, according to new research. "The Colorado River found a path and carved the entire canyon 5 (million) to 6 million years ago," says a geologist who used data measuring the cooling of rocks with time. But while the canyon as we know it may be relatively new, the river recycled portions of old canyons, at least one of which is indeed 70 million years old, LiveScience finds. If you were to dig with a shovel starting today and remove dirt at a rate of one cubic foot per 5 minutes (about 1 shovel full every minute) and do that for 5 million years, you could dig a tunnel 3 feet by 3 feet by 11,060,606 miles. That would go completely around the earth 444 times or through the center and out the other side 1397 times. Point is 5 million years is a long time and a slow process can leave a very big impact given enough time. "More than half of it is young; a quarter of it is middle-aged—15 (million) to 25 million years old; and the rest of it is 70 million years old," Hmm....I never knew I had so much in common with the Grand Canyon.